Nepotism may be problematic in terms of morality, but it sometimes works out for the best. 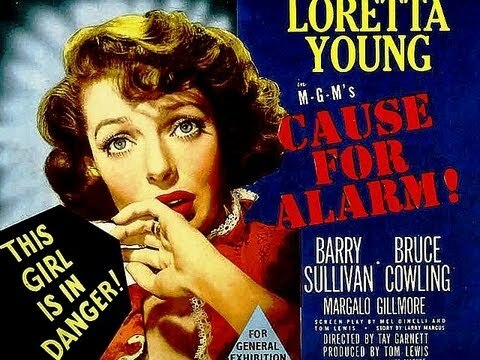 We watched an example the other night: The 1951 film Cause for Alarm. This movie didn’t do well at the box office, and it has been so neglected that it is in the public domain. But it’s a thriller that still holds up after more than sixty years, and its merit is due in large part to its simplicity. 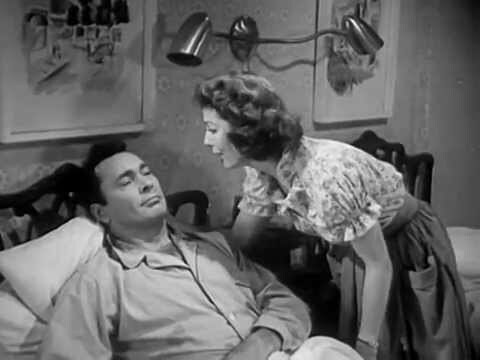 Cause for Alarm stars Loretta Young as Ellen Jones, Barry Sullivan as George Jones, and Bruce Cowling as Dr. Ranney Graham. The score is by Andre Previn. In this story, which Young narrates, Ellen meets George, an army pilot, during World War II. They are introduced by Dr. Graham, who is fond of Ellen but seemingly too busy for a relationship. George comes across as annoyingly self-assured and narcissistic, but Ellen falls for him and, after the war, they marry. Fast forward their lives, and George has suffered a serious heart attack and is bed-ridden at home. He has become paranoid and imagines that Ellen and Dr. Graham are plotting to kill him by administering overdoses of his medications. He makes this accusation in a letter to the district attorney—addressing it to the DA only by name, not by title—and asks Ellen to mail it, telling her that it’s related to his insurance business. When Ellen has handed the letter to the postman, George accuses her directly and threatens to kill her with a pistol, telling her that he will argue that he did it in self defense. At this moment, George suffers a fatal heart attack, and the rest of the film concerns Ellen’s frantic effort to conceal George’s death long enough to recover the letter to the DA. Most of the action in this film takes place in the Joneses’ home or outdoors in the neighborhood nearby. A significant portion of the setting for the story is George’s bedroom. In this mundane domestic atmosphere, the tension generated by Ellen’s growing anxiety is magnified. Although the situation is implausible, and the acting is of the arch variety that was typical of that time, the story is compelling as Ellen descends toward hysteria. The producer of this film was Tim Lewis, who at the time was the second of Loretta Young’s three husbands. Lewis had considered Judy Garland for the role of Ellen, but decided to cast his wife instead. The film required an actress who could project simplicity, even naiveté, because what makes the story work is that it is such woman who, through no fault of her own, finds herself in this dangerous position. No doubt Garland, who was only 31 when this film was made, would have done Ellen justice, but I doubt that in this instance she could have outdone Loretta Young. The director, Tay Garnett, shot this film in fourteen days by throughly prepping the cast and the crew in advance. 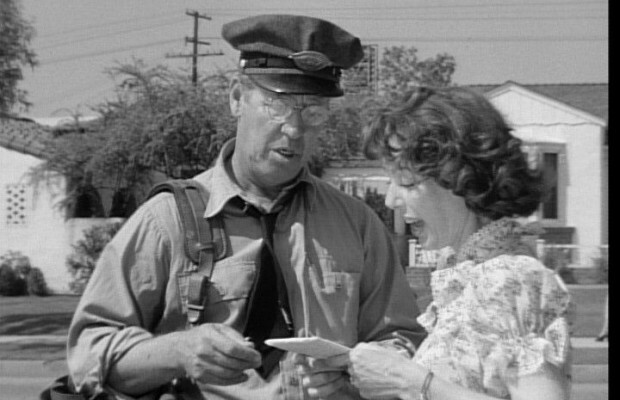 An interesting sidelight is that the postman is played by Irving Bacon, who appeared in well over five hundred films and television shows between 1915 and 1965, including twenty-eight films based on the comic strip Blondie in which he played a postman. The best news is that there’s no cause for alarm; you’re still out and about. I’ve been thinking about you the past two or three weeks, hoping all was well. It seems as though it is. For some reason, your review of this film brought to mind “Gaslight.” I think that one might be spookier, or more sophisticated, but still: there’s something about the experience of being trapped in inexplicable or implacable circumstances that can lead to panic or disintegration. This looks like a good one for the inevitable days to come when it’s going to be too cold and/or wet to work. For now, it’s all “A Wonderful Life” and “A Christmas Story.” I’m living in a politics and angst-free zone until New Year’s. No, there’s no cause for alarm. Four or five months just slipped past while I wasn’t looking — that’s all. I’ve been very busy and have not had time for writing and reading on line. This movie came to my attention because my wife has been reading a book about Loretta Young. She wanted to see another of Young’s films, but neither Amazon nor Netflix has it, so we settled on this one. It’s not in the same class as “Gaslight,” but on its own terms is interesting. My mother used to watch Loretta Young’s television series, and that’s the only way I know her. Incidentally, we saw “Brooklyn” this weekend, and that is a beautiful film. Have a very peaceful Christmas and the best new year you can imagine for yourself. I hope to be more present in these electronic precincts. Glad all’s well. I’ve heard very good things about “Brooklyn,” so have added it to my list.